Google Earth ! 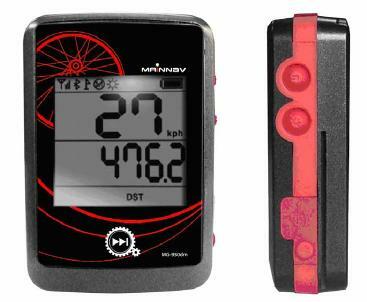 Shows speed, distance, elevation, and much more! Hokey Spokes Hokey Spokes are transparent "blades" that attach to your bicycle spokes. As these blades spin during riding, a computer inside the blades modulates the internal LED lights so that design images and custom text appear. 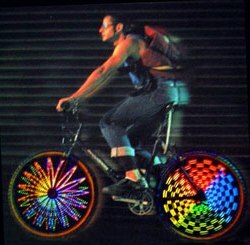 The user can decide how many spokes in a variety of colors they want to place on the bicycle wheel. Up to 6 "Blades" can be placed on each wheel. The more blades, the more visibility and persistence of vision at lower speeds. 2 Blades/Wheel look good, 3 Blades/Wheel look great, and more than three look amazing. The rider above has 3 Blades/wheel. In real life, they look even better! Blades are sold individually for $29.95*. See Order Page. Each Hokey Spoke contains a number of designs and messages. The blades can cycle through all the designs or can be set to play a custom text message all the time. Play mode is selected by using one of the waterproof keys located on any blade. * Blades with blue lights or in rainbow configuration are priced higher.